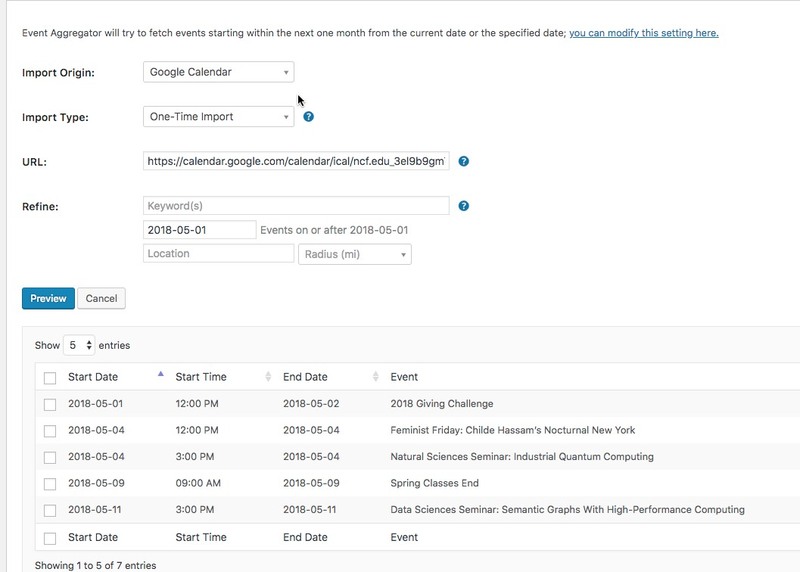 I am testing event calendar aggregator to see if it will work for our application. I set up a one-time import yesterday. After about 5 minutes it was getting no where, so I moved on to another task. I checked back this morning and it’s bee running for 19 hours, getting no where. I’d love to be able to stop it, but turning it off doesn’t stop it. Do I need to kill a cron or something? I’m really sorry to hear about the troubles with Event Aggregator. I’d love to help you get this sorted. I checked in our system and I see some successful imports already. Also I tested one of the feeds (ncf-edu_) and it imported events fine with my settings. Maybe that’s a problem. We have not had any successful imports. Your system is not reporting correctly. 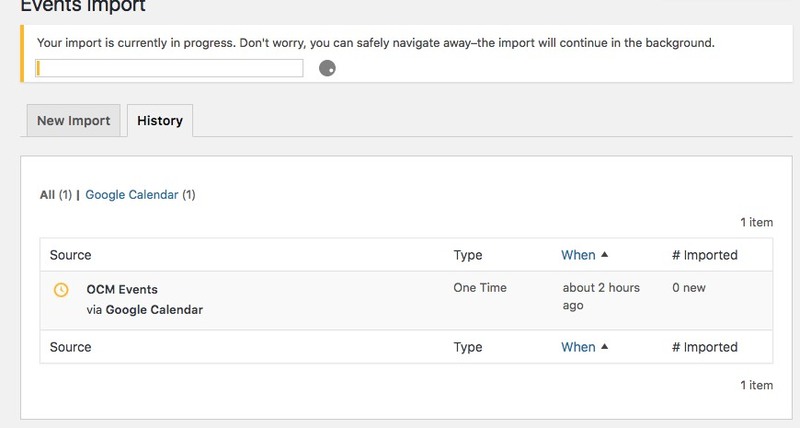 The import is in progress, so I cannot view the import settings in the backend to give you a screen shot. It’s also just a one time import. Attached is not the current import. 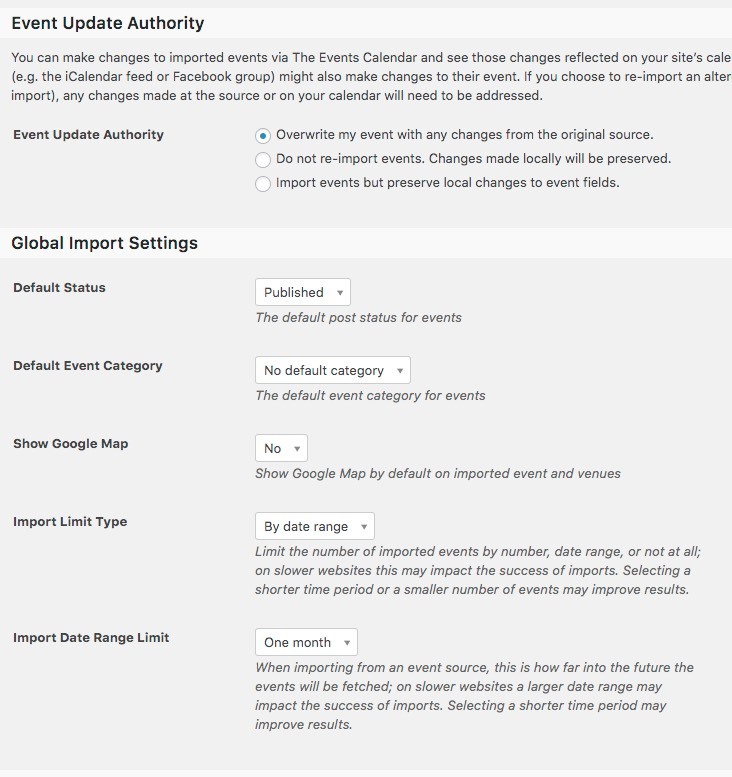 Import settings for google calendar are set to global settings. attached are the globals. Do the plugin read JSON, or just ICS format? Your settings seem to be ok. I ran a test import with that source you shared and it ran without an issue, the events got imported for me. I’ll try to pull in some extra EA-muscle to check this. I noticed you have some MU plugins as well. Do you think you could disable those somehow and run a test import like that? Alternatively set up a test site with only TEC at a host (even on your local machine) and try to test there? The plugin works with JSON but cannot directly read it from the user interface at the moment. I tried to go back to a previous version of the site and your licensing server went silly. 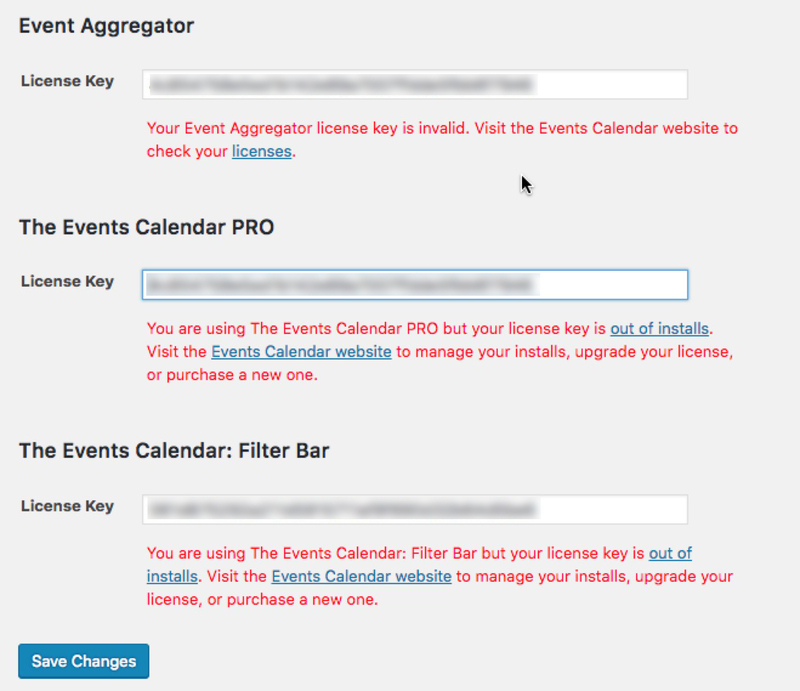 Your Event Aggregator license key is invalid. Visit the Events Calendar website to check your licenses. OK, so I got on chat with Advanced Support at WPEngine. We saw a couple things, but the error is not being reported. We say a continuous post to admin-ajax. We also saw the following error message pop up in the error console. I also was able to get an import to work on the staging environment. So the MU-Plugins are not the cause. Because there is no caching in admin for WPEngine’s live servers it is not a cashing error. The only real difference between the two places are the SSL cert and the domains. One is news.ncf.edu and the other is ncfnews.staging.wpengine.com. We use a lets encrypt cert on the live site. If that matters. Thanks for your help in investigating the issue. The information you shared is really valuable. In the meantime we also did some testing with WP engine and ended up with the same results. It looks like this is a glitch when using WPEngine. I have logged a ticket for this and one of our wizards will investigate this further to fix this. I believe the SSL certificate shouldn’t be an issue as long as the certificate is valid. I am going to set the status of this ticket to “pending fix” and we will update it once the fix is released. If you find out more about the issue on your side, please post it here. For any new questions or issues please create a new ticket and we’ll help you out there. Any movement on this, we are coming up on a month and would like to apply for a refund if fixing it is not a priority. Sure thing! And thanks for hanging in there. Just wanted to share with you that a new release of out plugins is out, including a fix for this issue. As always, we suggest to setup a dev/staging site so you can make all plugin updates without disrupting the live site. Please update the plugins and let us know if the fix works for your site. I just verified that the plug in is still working on WPEngine’s staging environment and my local environment, but not WPEngine’s Production environment. Is there anything that needs to be done to ease up on caching? Thanks for reporting back! This is indeed very curious. Can you please confirm to me, if on the staging site you do or do not have the three MU plugins you have on production? So far I see that is one major difference between your sites and can be the source of this. Meanwhile I will try to pull in some extra muscle for this as well, to get a different perspective. I ask for your kind patience. If you didn’t do so yet, please clear your transients and cache and try running the import again. restored from the back up to stop the import. I’m really sorry that this issue is so persistent. I have escalated the problem and one of our developers is going to take a deeper look into this. I would be interested in one more thing, if you have a bit of time and the will to try. If you set up a brand new site from scratch (it could event be under a subdomain), only with TEC, are you having the same problem that the events do not import? You can use the same EA license key, it can be used on 10 different domains. We need to launch this site in about 2 weeks, so rebuilding from the ground up is not an option at the moment. Can you just tell me where the queue information is?